*Caution: Wear plastic or rubber gloves and do not touch your face while handling or cutting hot peppers. If you do not wear gloves, wash hands thoroughly with soap and water before touching your face or eyes. 2. Wash, peel and cut chayote and pears into ½-inch cubes, discarding cores and seeds. Chop onions and peppers. 3. Combine vinegar, water, sugar, salt and spices in a Dutch oven or large saucepot. Bring to a boil, stirring to dissolve sugar. 4. Add chopped onions and peppers; return to a boil and boil for 2 minutes, stirring occasionally. 5. Add cubed chayote and pears; return to the boiling point and turn off heat. 6. 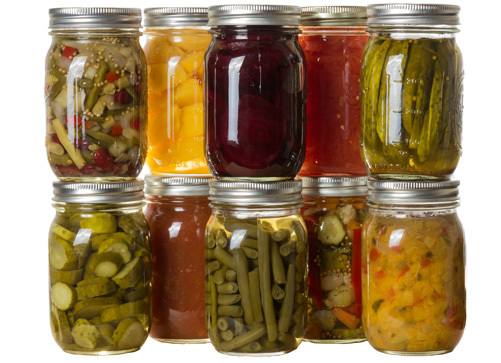 Fill the hot solids into clean, hot pint jars, to within 1 inch from the top of the jar. Cover with boiling hot cooking liquid, leaving ½-inch headspace.